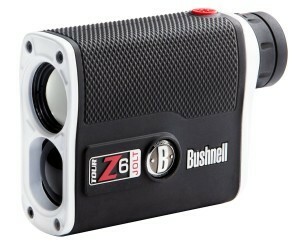 The Bushnell T our Z6 JOLT rangefinder is an upgraded version of the standard Tour Z6 model. The Tour Z6 JOLT offers its PinSeeker function with JOLT technology that emits a quick vibration to alert the user when the flag has been acquired. E.S.P. 2, or Extreme Speed Precision, Second Generation, offers faster distance readings with improved accuracy. Vivid Display Technology improves contrast and clarity of information. The advertised range is from 5 to 1,300 yards with 450 yards to the flag and one-half yard accuracy to the first 125 yards. The unit is also fully waterproof, offers 6x magnification and is legal for tournament use. JOLT Technology: This updated model comes with the addition of JOLT technology that provides bursts of vibration once the device locks on to a target. Vivid Display:The display offers red crosshairs that are easier to see as compared to black ones. Firing Button:The button used to fire the laser can be difficult to engage as it requires a very firm press. Limited Scanning Mode:The Tour Z6 offers only limited ability to pan across landscapes while receiving updated distance information. The Tour Z6 JOLT is vertically-oriented and held within a rubber exterior for easier gripping. The unit weighs 7.9 ounces alone and 11.6 ounces when used with the carrying pouch that is included. The display is clear and simple to read and features a tint to reduce glare, and it also offers an exceptionally wide field of view. There are two buttons on the device. The red button on top turns the device on and fires the laser. On the left side of the device is located the mode button that allows the user to access the system menu. In order to engage the power button, it takes much effort and must be firmly pressed. This is inconvenient as it must be pressed twice in order to receive distance readings. PinSeeker mode is constantly on, preventing the use of automatic scanning found in earlier Bushnell models. Once the device locks on the user cannot scan to a separate far target and receive an updated distance, making it difficult to determine distances to multiple targets for specific shots. The Tour Z6 JOLT offers Vivid Display Technology that provides distances in red instead of black, making them easier to read against dark backgrounds. There are also four varieties of brightness available. PinSeeker mode is used to identify the closest object within the crosshairs while disregarding background objects that may be larger or give off stronger signals, such as trees. The laser can be fired continuously for 4 to 8 seconds, and when the button is released the distance will continue to be displayed for 8 seconds. The unit is fully waterproof and features a rain-guard coating to assist the lens in avoiding water stains. The display shows the distance continuously, without blinking like some units. 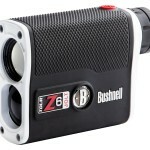 Bushnell claims that at less than 125 yards the unit can show distances down to one-tenth of a yard. In reality the device can do so at some times and fails to do so at others. The company claims that the Tour Z6 JOLT has a range of 5 to 1,300 yards with the ability to acquire flags at up to 450 yards in prime conditions. The device actually tends to pick up more reflective targets behind the flagstick until PinSeeker actually kicks in, then the device continues to update the distance as the firing button is held down while locking on to the target. The best method to avoid the initial problem is aiming at the flag instead of the stick, or aiming at the base of the flagstick. 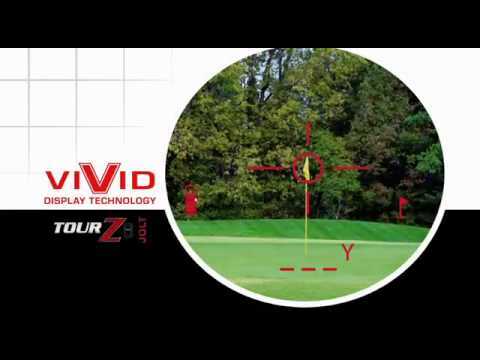 Once the distance exceeds 200 yards the device becomes less and less accurate. The Tour V6 JOLT can be purchased for nearly $400, making it average for standard laser rangefinders. Luckily, it has the features necessary to compete with many competing models in its class.